I thought I’d give you all a glimpse into the inner workings of my mind… and my kitchen! 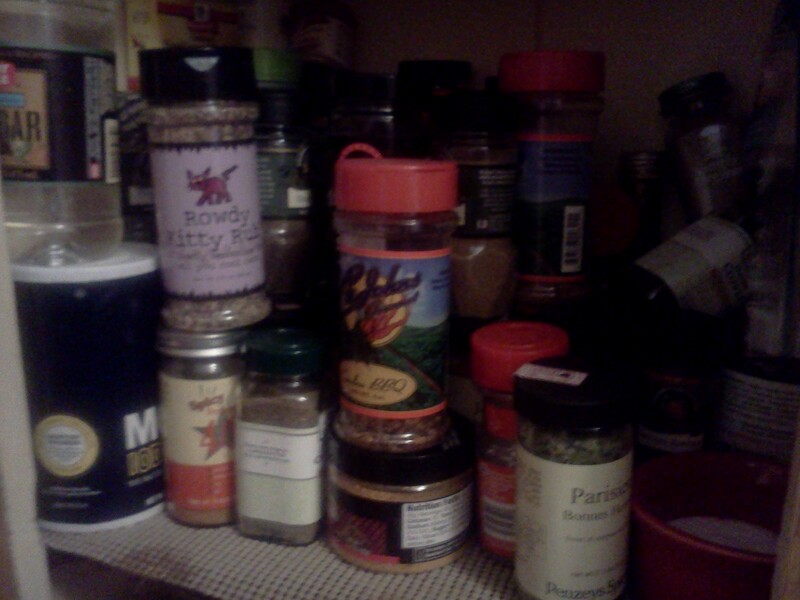 As I was writing about my Everything Salmon the other day, I realized that my spice cupboard would by most people be considered… messy. Out of control. I mean crazy insane. Anyone else who tries to cook in my kitchen and find a specific spice (other than salt and pepper, which live on the counter for easy access at all times) had better have some time and some patience. Two shelves and hangers on the door of this cupboard are filled with spice jars and other seasonings like balsamic vinegar, hot sauce, etc. And I’ll admit it – there is no organization. I’ve tried! I’ve tried to organize it several times (hence the hangers on the door), but it never takes. Let’s keep it real. This is my spice cupboard. Close up of the second shelf. 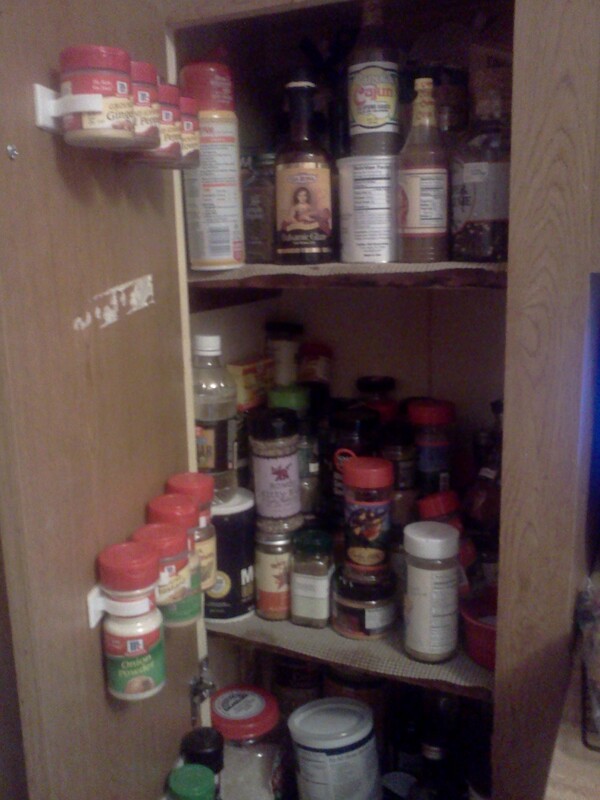 Even with the chaos of my spice cupboard, I know roughly where each spice lives. For example, if I want the Penzey’s Bavarian Spice, I know the shape of the jar, that it has a black lid, and it’s probably on the bottom layer of spices. Yep, the spice jars are stacked in a double layer – otherwise there isn’t enough room! The whole nutmeg is in a thinner glass jar with a black lid, on top in the back right hand corner. When Brian wants to cook, it makes him crazy. Typically, he tells me what he wants out of the cupboard and I just find it for him – it’s easier for both of us! I know it’s nuts, but there’s something about the chaos that soothes me. (Is that weird?) It’s funny, but now that I think of it, my desk at work is the same way! Stacks of papers and folders that look random at first glance, but I can locate anything I need – until I try to organize it. Then I can’t find anything! 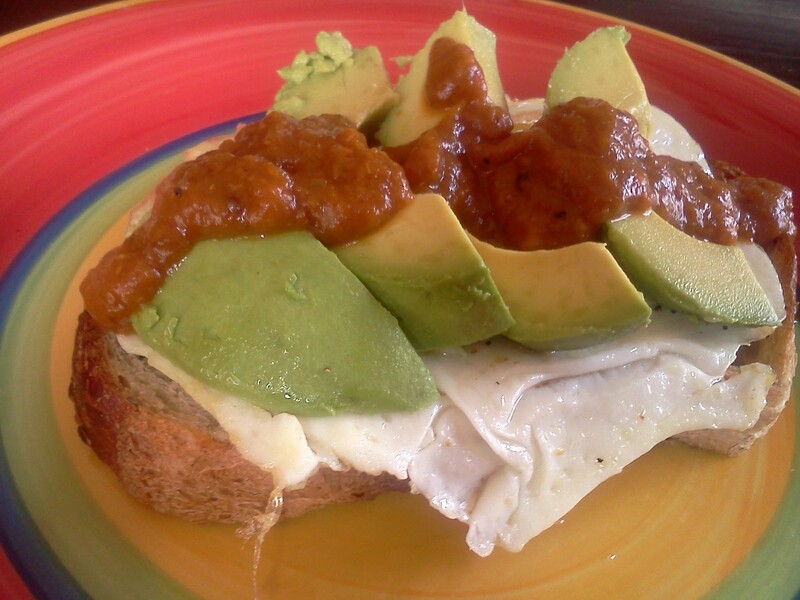 Because I hate to do a post with no food pictures, here’s a teaser for next week: Whole grain toast, a fried egg, avocado and butternut squash mole sauce. I’ll post the recipe for the mole soon! Anyone else love them some kitchen chaos? Or does the picture of my spice cupboard scare you a bit? Now that you’ve seen it, can we still be friends? This entry was posted in General and tagged kitchen organization, ramblings on March 29, 2013 by Melissa. Your Uncle Kim and I laughed out loud when we read this! We, as you know, are completely addicted to Penzey’s Spices and have been working for years, actual years to have some kind of spice organization! Kim installed some shelves inside of our pantry door and he organized them to his liking. However, his kind of organization makes no sense to me! So we sort of rearrange the shelves depending on who is cooking. Mostly I just close the door and hope nothing falls out. I will post a photo at some point in time! Since I move every few years, I’ve had a wide variety of spice cupboards, and I adapt to whatever I’ve got to work with at the time. 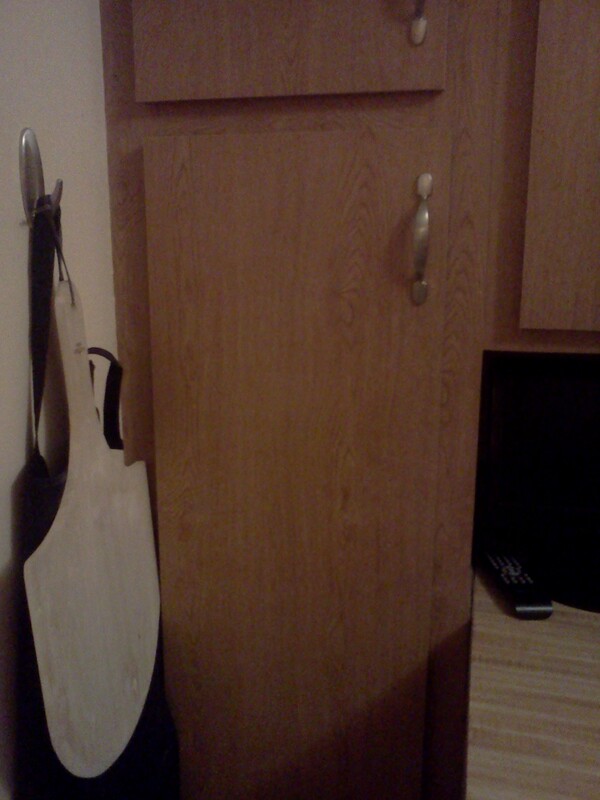 Currently I am using a pair of drawers, because in this kitchen I more drawer space and less cupboard space. The drawers are loosely arranged with more savory or taller spices in the upper drawer and more sweet or shorter spices in the lower drawer. Each year, or each time my kids want to do something for me (birthday, Christmas, etc) I ask that the spice lids get labelled. It’s a great task because it’s do-able for my son with his trusty label maker, and the result is really helpful for me. I mean, from the top, what’s to differentiate between the Bavarian Spice and the Baking Spice? What a great idea and a wonderful way to stay organized! I know you love the Penzey’s spices, and their lids are just made for labels. Thanks, Kirsten! This is a brilliant little essay! I swear you could write for the New Yorker. Thanks, Jess! I used to constantly try to be more traditionally organized, but it was a losing battle. As long as I can find everything when I need it, that’s organized enough for me! I love that those special items from home have traveled with you. You can take the girl out of Ohio, but you can’t take Ohio out of the girl!